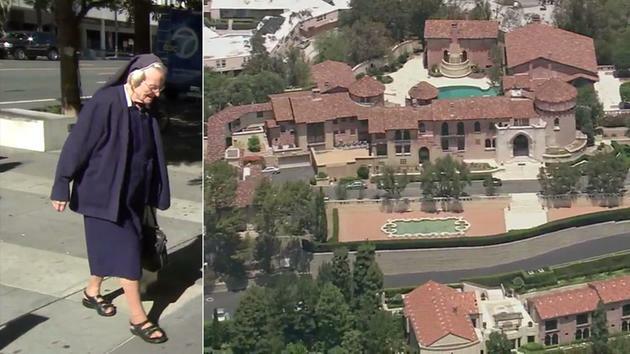 During the legal battle between nuns and Katy Perry over a Los Feliz convent, one of the nuns involved in the case collapsed and died Friday during a court proceeding. The community is saddened over the loss of 89-year-old Sister Catherine Rose Holzman of the Sisters of the Immaculate Heart. An LA County judge ruled against them clearing the way for the LA Archdiocese to sell their Los Feliz convent to singer Katy Perry. “You have stolen the property of the Sisters of the Immaculate Heart. Please archbishop... Do what is right in your heart,” Sr. Callahan pleaded. The sisters have lived at the 8-acre Los Feliz property since 1973 and say they have documents proving they are the rightful owners. They even released a documentary to tell their side of the story. They wanted to sell the property to local businesswoman Dana Hollister who had plans to turn it into a boutique hotel. “We asked her to save us, to buy the property. She had nothing to do with forcing herself on us,” says Holzman. But last fall, a jury found Hollister guilty of malice and fraud for allegedly interfering with the sale of the property. She was ordered to pay $15 million in damages to the LA Archdiocese and Perry’s lawyers. Hollister filed for bankruptcy and for now, the judge has put all proceedings on hold. “We’re trying to get out to the public to say what is being done to Dana Hollister is absolutely wrong, the judge was wrong, the jury was wrong. They even admitted it afterwards because they didn’t get both sides of the story,” Callanan said. The Sisters say their convent is under the direct control of the Vatican and has never been a part of the LA Archdiocese. The nuns say they are now appealing to Pope Francis directly to give them their convent back. “We have an agreement with Rome. It’s in writing and it says if there are any disputes, they are to be settled in Rome," says Callanan. And they’re also making a plea to Perry herself. "And to Katy Perry, please stop. It’s not doing anyone any good except hurting a lot of people,” Holzman said.